Fifty or so years ago, in a small, rather shabby cafe in the Greek city of Piraeus, you could have witnessed some of the many varied moods of rembetika. They were usually moods of despair, lost love, imprisonment, dispelled briefly by the smoking of hashish and perhaps permanently by meeting with Kharos (the ferryman - death). But there was always the music to revive a tortured soul. A music that was centuries old, but was as fresh as the sea air. A music that compelled you to sing and dance and which could ease for a while the kaimos (despair, blues) that was eating into your heart. Imagine a lone figure sitting in this cafe. He is a manga, a creature of the underworld. His mode of dress is instantly recognisable - kind of gangsterish look, with a heavy knife stuck through the belt, the jacket slung over one shoulder, a fedora hat, a cigarette hanging from the mouth, and all the time the kombolo (worry beads) twirling incessantly in one hand. His eyes are rivetted on the corner of the room where a small group of musicians are tuning their instruments, a bouzouki, a guitar and a baglamas (a small bouzouki). Finally satisfied with the process, slowly the bouzouki player begins a series of notes that lead to a particular key. When he has found the thromos (road) his companions provide the accompaniment, a heavy zeibekiko rhythm. Slowly the manga begins to snap his fingers, then rises and begins to dance, bending and weaving his body. His eyes are closed and he seems to be in a trance. When the music stops he returns silently to his seat. As a dancer he was very good, yet no-one applauds. He has been released. He has danced for himself alone. To applaud would have been an insult. The origins of rembetika can be traced to the middle of the last century. The agrarian economy of the country gradually began to change after the War of Independence in 1921 into a more concentrated urban development. After 400 years of Turkish rule the cities and ports underwent an industrialisation programme, increasing their size and population. As the lower classes, in the face of this changing situation, turned inwards for support and strength, a sub-culture - the Rembetes - became separated from normal society, which they eventually came to mistrust and despise. The Rembetes became definable as a people who were anti-establishment and who defied the traditional behaviour pattern. They would scorn work, refuse to marry, hate the police and would consider going to jail a point of honour. This, in a society where marriages were often arranged and men regarded work honestly, looked after their families and respected law and order, was a complete reversal of the status quo. During this urban development the Rembetes (or manges) were establishing control of all the various underworld activities. In their favourite hang-outs in Piraeus, Athens and Salonika, they ran the lucrative hashish markets, brothels and gambling houses and organised the smuggling and distribution of stolen goods. Even to a casual observer, it would not have been difficult to recognise a manga. His mode of dress was quite startling - almost a modern equivalent of the Regency beau: a dark, tight suit, collarless purple shirt, narrow pointed shoes (with high heels), a fedora hat, and a heavy sash around the waist. The latter served as a repository for money, tobacco (or hash), a knife, or a revolver. Anyone who stepped on this sash was in trouble! Persecution by the police was intense, and consequently the songs that were composed whilst in jail form an important part of the rembetika chemistry. These songs are rich in information about the trials and tortures of the Rembetic way of life. They have their own argot, which even to this day would produce a frown on any middle-class Greek face. In 1922, following the failure of Greek territorial exploits in Turkey, there began a mass exodus of refugees from Asia Minor to the Greek mainland culminating in the burning of the port of Smyrna by Turkish troops. This displacement of one million people, Greek in name but entirely Turkish in existence, had a dramatic effect on Greece both economic and cultural. The dominant Turkish mode of singing and music, known in Greece as the Smyrnaic style quickly established itself on the Greek mainland and, combined with the introduction of a whole range of new instruments, had a direct influence on mainstream Greek music that lasted until the early Thirties. 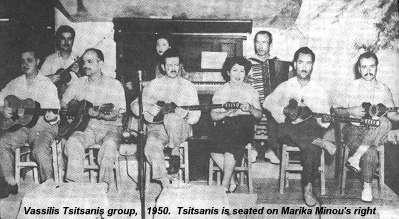 Over the next two decades however composers such as Vamvakaris, Papaioannou and, the greatest of them all, Vassilis Tsitsanis, were to emerge and to shape forever the styles of singing (usually two- or three-part harmony) and accompaniment (bouzouki, baglamas and guitar) that characterise Greek music to this day. Although some of the song content would inevitably have been censored and the length of performance curtailed, gramophone recordings from the earliest years of this century have fortunately captured these separate musical traditions and above all the emotion of the music. In rembetika, about a dozen different keys are used and these are usually decided upon by the makam, a long, wandering series of notes, the final result of which is known as a road. Some of the 'roads' correspond to Western scales of the minor variety but mostly the use of minor 7ths and 3rds and augmented intervals make them quite different. The human voice, being the first musical instrument, would tend to lead the direction of the instrumentation, and this was certainly the situation in 'the cradle of rembetika', the Cafés Aman. Originally Turkish (Mani Kahuesi), these were the places where the manges would hang out, smoking their hash and singing and playing their music. The songs would almost always be improvised and in order to find the time for spontaneous composition the phrase Aman Aman would be used, held over a long series of notes. The zeibekiko originated with the Turkish Zeybek tribe and was introduced into Greece at the time of the Smyrna incident. It quickly became the favourite of the Rembetes who preferred it for its highly individual style of performance. The dancer is allowed great latitude, for as well as being a serious, introverted dance, humour can be introduced by various feats of showmanship (standing on bottles, lifting tables, chairs, etc). Most zeibekiko dances commence with a taxim - a long series of wandering notes eventually settling down into a mode - thus creating an atmosphere and setting the mood. The hasapiko, or Butcher's Dance, has a 2/4 or 4/4 time and is performed by two or three dancers. An atmosphere of camaraderie is created with arms linked around shoulders and a set pattern of steps changed or created with each performance. In modern times a watered-down version, known as the sytaki, has become the favourite of tourists, dancing en masse in their hotels and tavernas. The karsilama is a variant of the zeibekiko with a 9/8 rhythm, and is a couples dance, its name coming from the Turkish karsi (i.e. opposite) and lamar (i.e. to do). The tsiphte-teli is basically a belly dance with a 4/4 rhythm. It was not popular with male Rembetes but a favourite with female singers and dancers. To a large extent the film Never on Sunday gave the outside world its first taste of the bouzouki. However the history of the instrument in its current form can be traced back to the early 1800s. It derives from the Turkish saz family of instruments and was originally equipped with gut or brass-wire frets and simple wooden tuning pegs. The name derives from the Turkish buzuk (i.e. damaged or broken). 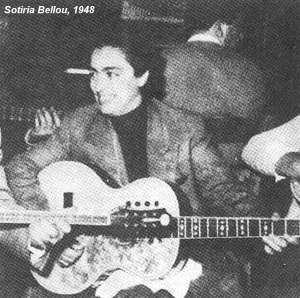 The older form of the bouzouki used in Rembetika had six strings tuned in pairs. Although capable of many different tunings the most common were D-A-D, G-A-D or an open tuning A-E-A. These tunings, or douzenia, varied according to locality and musician but generally the third or thickest strings were a split octave. For sounding the notes the fingernail was originally used but but later a simple pick or plectrum was employed. Because of the nature of the tuning the melody would be played on the first string with the others used as drones. This differs from modern bouzouki music which uses eight strings, tuned in pairs, and tuned to the first four strings of the guitar but a tone down - C-F-A-D. This enables the musician to play rapid passages more easily and, of course, to change key without retuning. The baglamas is a smaller version of the bouzouki. Due to its size it was an ideal instrument to play when in jail as it could be easily concealed. On many recordings you will hear it as a light tinkling on the off-beat behind the guitar and bouzouki. 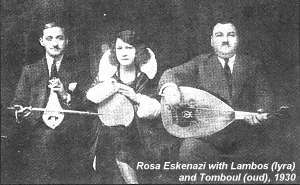 Other instruments employed by Rembetes (in addition to universal ones such as the banjo, guitar and violin) include the oud and the tomboul (a multi-string guitar). The kanoni (or kanonaki) - a zither-like instrument - and the sandouri - a member of the dulcimer family - were also popular, while accordions and clarinets featured from time to time. The great rembetika singer Sotiria Bellou sings a song H Koinonia (Damn Society) on Rembetika Songs (Lyra 3248). This superb recording made in the mid-Sixties is for me a total expression of the opinions and attitudes of the Rembetes. To suffer and be tormented. I felt the cruelty in the world. I've not seen any joy in the world. Of whatever I deserved in life. I will always be tormented. Protest songs take many forms and this one is straightforward in its message from the underdog. However, to fully appreciate many of the songs of the Rembetes, a closer look must be taken at the hopes, fears and taboos of the society in which they had to exist. The themes of most of the songs, whether Smyrna or Athens style, were emigration, hashish, prison, women, sorrow and despair, while death, mothers and lost youth featured prominently. The mother fixation is very strong and the despairing cry Mana (mother) or Mana-moo (little mother) can be heard on many recordings. If the mother was adored, then the mother-in-law was not, generally being regarded as cruel and scheming. In one song from the Thirties an account of an actual murder case cites the mother-in-law as the organiser of the crime. If the role of the wife of a manga followed the traditional pattern, his girl friends were generally more liberated. Many would have been prostitutes or factory workers - or gypsies whose love of hashish and devil-may-care attitude made them very popular. All in the night , where to ? I'll come with you forever. Crazy gypsy, where are you going? All alone, you abandon me. I'll come with you whatever happens. The years of suffering endured by the Greeks in the Second World War inspired a great many songs. The partisan army (EAM-ELAS) seemed to hold the country together while under Italian, German and finally British and American occupation. Coupled with the Civil War (between Left and Right, culminating in Communist witch-hunts) the conditions were, to say the least, harsh. But life goes on during such times and this was certainly true with the Rembetic underworld. There was always the chance of making money by stealing jerry-cans of petrol from German trucks, and the cafes and restaurants provided work for singers and musicians as usual. 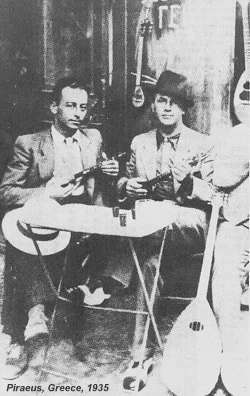 One of the most famous of all Rembetika songs was written during the War years. Cloudy Sunday, by Tsitsanis, is one song I think every Greek to this day seems to know. The song was written to commemorate the death of a Greek girl killed by the Germans. Which is always cloudy, Christ and the virgin. You're a day like the one I lost my joy. Cloudy Sunday, you make my heart bleed. When I see you rainy, I can't find a moment's peace,. You make my life black and I sigh deeply. Violent death was forever a real possibility to the Rembetic while drug and drink addiction took its toll. Furthermore tuberculosis was prevalent until the middle of this century and was regarded stigmatically by many Greeks, as cancer is today, and deaths were often hushed-up by the families of the deceased. When we're young it makes us ghosts. I feel like my body's tearing apart. Night's blowing in, black and dreary. Tyrannises me without pity ? That even Kharos shows me no pity. The world turned away, I don't know what to do. And slowly my body began to waste. After smack drove me out on the streets to die. However, to escape a violent death or beating at the hands of a fellow manga or in police custody, there was always emigration. This was regarded as the worst of all fates, a living death. In fact nearly all the songs on this theme had some reference to H Mayph Eenitia (a black foreign land). Life in a new country was tolerated for the sole purpose of sending money home, and the day of return to the motherland was eagerly awaited. I can't stand it, Mom, my body's wearing out. It takes kids from life and wastes their poor bodies. Mom, and getting out of the misery of this alien life. I'm bringing her, Mom: all three of us will live together.